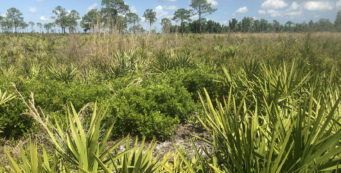 Sabal Point Sanctuary | Florida Hikes! Following an old logging tramway into the heart of a protected 2,500-acre floodplain forest where the Wekiva River and Little Wekiva River meet, the trail through Sabal Point Sanctuary is a simple one but quite beautiful, especially in fall when the hickory trees and red maples shed leaves in gold and crimson across the footpath. 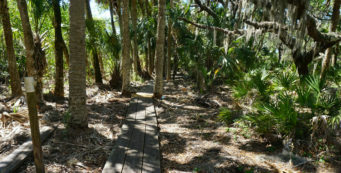 It’s an out-and-back walk, so meander as far as you like down the shaded corridor through this swamp – and don’t miss the side trail to the big cypress at Hog Island. Open 8 AM to sunset. Leashed dogs permitted. This trail is located at the back of a major subdivision and parking is limited. Do not block the gate. Check the kiosk for a trail map and guide. From I-4 exit 94 drive west on SR 434 for 0.9 mile to Wekiwa Springs Rd. Turn right, then right again after 0.8 mile onto Sabal Palm Dr. Follow the curving road through the subdivision for 1.5 miles to Wilderness Dr, on the right. Drive to the end of the road. From the trailhead, start down the deeply shaded tramway. 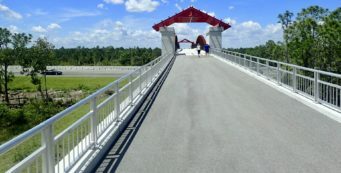 Within the first quarter mile, the trail makes a sharp left curve, and then continues along its broad, straight path, passing through an open gate. There are scattered interpretive signs along the trail—take the time to read them, as they explain the flora, fauna, and history of the swamp. Cinnamon ferns and marsh ferns fills the breaks between the needle palms. Caladium grows in dark but clear tannic ponds, and bamboo stands tall along the trail’s edge. A southern magnolia towers overhead, sun glinting off its massive glossy green leaves. Watch for the enormous cypress stumps along the trail, hints of a wilder forest of more than a hundred years ago. You’ll find the only bench along the trail at 0.5 mile, next to the start of a side trail down an old tram road. Marked with red-topped posts, the trail is a Boy Scout project, a 0.5-mile long round-trip that leads down to an ancient live oak and a stand of wild orange trees. To stay on the main trail, continue straight. The surrounding land rises slightly. No longer wet, it becomes a forest of loblolly pines. As the open space around you widens, you’ve reached Hog Island, a high and dry island in the middle of the swamp. The aroma of pine needles fills the air; young pines repopulate a large grassy clearing that may have hosted a logging camp. A hammock of live oaks and laurel oaks provides shade. Several unmarked trails vanish into the forest, particularly around the large pond on the right. 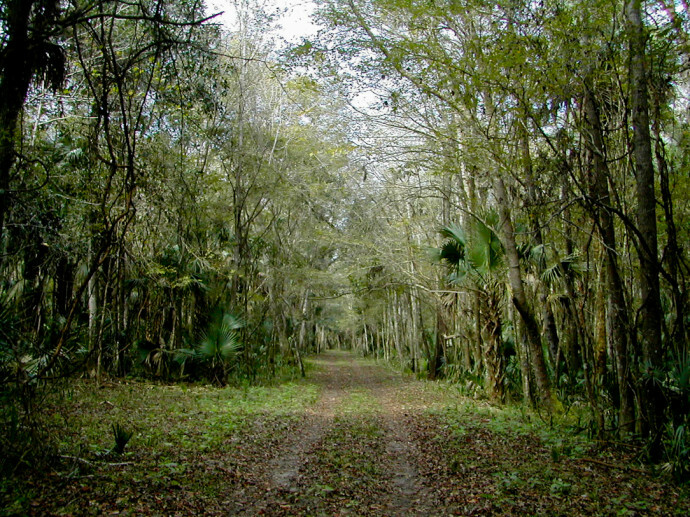 You are welcome to explore the tram roads leading out into the swamp, but carry a compass and note your starting point—people do get lost in these woods. Lily pads float serenely on the dark water as small birds flutter between the reeds. An alligator lazes on an island within an island, a second pond hidden under a floating carpet of duckweed. Draped in Spanish moss and wild pine, a live oak stands sentinel over a clearing, towering more than a hundred feet high. The forest closes in, cool and damp, as you leave Hog Island, the floodplain forest giving way to hydric hammock. A red-shouldered hawk dives low under the canopy, protecting its territory. At 1.4 miles, the trail passes through another open gate. Bald cypresses begin to appear in the forest as you walk past several umbrellas trees, an Australian species that adapted to Florida’s climate. Flowering in summer, their pinkish-red blooms cluster along a stalk up to 15 inches long. You pass the first trail mileage marker at 2 miles; trail markers continue to appear every half-mile. The trail starts curving off to the left. Marsh ferns smother the chunky root balls of the cabbage palms, just out of reach of the water. Shelf-like polypore mushrooms cling to the rotting bark of fallen oaks. Young southern red cedars grow along the edges of the trail. Broad clearings sporadically break up the long, green corridor, some marking the junctions of narrow tramways used by the logging company to drag felled trees out of the depths of the forest. After 2.5 miles, cypress knees creep close to the trail. The fronds of young cabbage palms – full-size, despite the tree’s trunk rising only three or four feet – create a dense green understory. Pay attention to the ground underfoot as you approach the 3-mile marker. Delicate violets rise through the grass, showing off their blooms of pale purple, white, and lilac. As the trail passes through another clearing, it veers off towards the right. When you come to the fork, turn left, passing a small green building that is part of an old hunt camp. There is still a private landholding in this section, so if you see trucks or campers, the hunters are in the woods. Respect their property – and your safety – by finishing your hike here, turning around and retracing your steps. When the camp is unoccupied, you are welcome to continue hiking to the dock on the Little Wekiva River. Enjoy a reflective moment along the slow-moving waterway, where limpkins probe the shallows for apple snails. At 3.5 miles, this is the end of the trail. Retrace your steps back along the logging trail to Hog Island, returning to the gate and parking area after a 7-mile hike. Just walked this trail today. The gate is indeed closed with Private Property No Trespassing Signs well before any hunting cabin. Didn’t see any mile markers, and the few information placards were so old that they either didn’t contain any writing or were illegible. Couldn’t understand where Hog Island was, and there didn’t seem to be any marked side trails. Even with all that, it was an excellent trail, felt extremely secluded, and I will definitely return. Walked the trail. 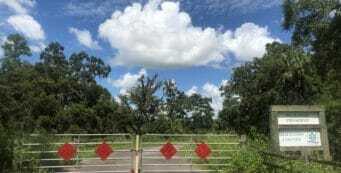 about 1.5-2 miles in is a locked gate with Private Property – NO Trespassing signs. (Three this time). It is well short of the sanctuary map….may we keep hiking in there? Will the gate be unlocked??? That’s very sad to hear. Sounds like someone responsible for conserving this area allowed something to slip, like what happened to a piece of the Florida Trail at Taylor Creek near Okeechobee. Thanks for the heads-up. It’s not clear if the trail encroaches into private property, by up to 55 feet (east west), for about 1000 feet north south, or if it follows the curving property line, the trails data isn’t always terribly accurate. The FDEP trails data lists the source of this segment as CHRISTOPHER OMAN, ST. JOHNS RIVER WATER MANAGEMENT DISTRICT, DIV OF OPERATIONS AND LAND RESOURCES, 12/21/2011. I think it likely the property line follows the tramline that the trail follows thus there is no encroachment and the gate is placed in error.